The equine upper airway (UA) includes the nostrils, nasal passages, paranasal sinuses, pharynx, guttural pouches, larynx, and the cervical part of the trachea. As such, it is also referred to as the ‘extrathoracic airway.’ Since horses are obligate nasal breathers, the UA is the only conduit for airflow to and from the lungs, making a normal airway essential for the horse. Obstructions of the UA often result in characteristic symptoms that allow a differentiation from lower airway problems without pursuing further diagnostics. Familiarity with these symptoms can be particularly helpful in cases where severe respiratory distress requires emergency treatment before a thorough diagnostic workup can be performed. Sudden onset of severe respiratory distress in the resting horse is an uncommon presentation, but one that can rapidly develop into a life-threatening situation. Respiratory distress is characterized by an inappropriate effort to breathe, including an increased respiratory rate, exaggerated intercostal and/or abdominal effort, flared nostrils, an extended head/neck position, and respiratory noise. Stridor, an abnormal, intense respiratory noise that is audible without a stethoscope, is more likely to be present in horses with obstruction of the upper rather than lower airway. Although some UA diseases (e.g. nasal masses) result in abnormal inspiratory and expiratory noise, obstructions of the upper airway predominantly cause noise during inspiration. This is the result of subatmospheric airway pressures that develop during inhalation. These pressures can collapse the nostrils, larynx, and pharynx, all of which are structures of the extrathoracic airway that are not supported by bone or cartilage. Causes of acute respiratory obstruction in horses. 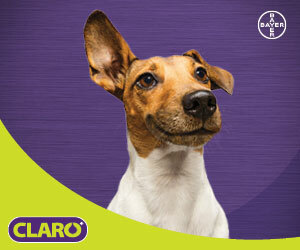 If stridor is apparent at rest, it is best to assume that >80 per cent of the airway is compromised. Once noise and laboured breathing are clinically noticeable, progression to complete obstruction can be rapid. It is therefore advisable to treat any acute respiratory noise at rest as an emergency. While identification and resolution of the underlying disease are the ultimate goals when treating a horse with UA obstruction, it may be necessary to secure or establish a patent airway before a thorough diagnostic workup can be completed. If available, oxygen insufflation (10 to 15 l/min in a 500-kg horse) should be offered until adequate airflow has been restored. 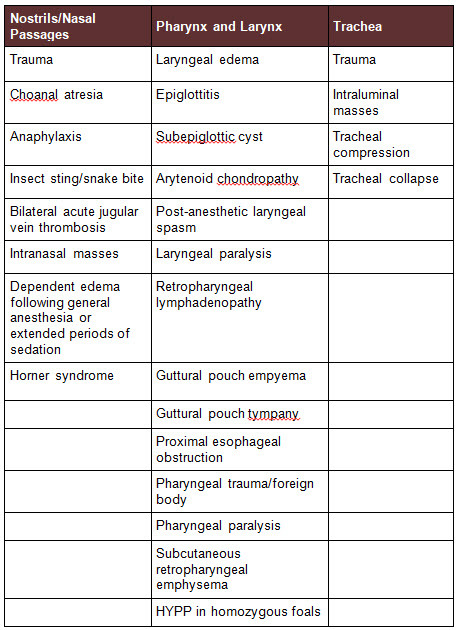 The following are selected causes of acute upper airway obstruction. Nasal obstruction: Obstructions of the nostrils or nasal passages must be bilateral to cause significant airflow reduction, and are an unusual reason for respiratory distress. Some of the most common causes of acute, bilateral nasal obstruction include trauma, bee stings, ant bites, snake bites, and acute bilateral jugular vein thrombosis. Anaphylactic reactions can also result in facial swelling and severe obstruction of the nostrils (See the section on laryngeal edema on the opposite page). When treating a horse with blunt trauma to the nose, considerate use of tranquilizers is recommended. Prolonged lowering of the head leads to increased edema formation, and most sedatives tend to escalate UA resistance, further decreasing airflow. Icing of the nose is most likely to help in cases where the nares are swollen, while swelling within the nasal passages is better addressed by spraying lidocaine with one per cent 1:100,000 epinephrine (25 ml per nostril in an adult horse) or 0.1 per cent epinephrine spray (20 to 30 ml total/adult) into the nose. If concerns about continued swelling exist, introduction of a small nasotracheal tube (e.g. garden hose, large naso-gastric tube) with a minimal diameter of 1 to 1.5 cm can be helpful. In cases where these treatments fail, a tracheostomy is recommended. In horses where thrombosis of one jugular vein is present or developing, the contralateral vein should only be used for blood collection or administration of fluids/medication when other veins (i.e. superficial thoracic [spur], cephalic, or transverse facial venous sinus) are unavailable. If both jugular veins are affected, maintaining the head of the patient at or above shoulder level is important to avoid the development of dependent edema. Administration of furosemide (1 mg/kg slowly IV) should be considered. Depending on the extent of the swelling, a temporary nasotracheal tube can be placed in the nasal passages or an emergency tracheostomy may be necessary to ensure sufficient airflow. 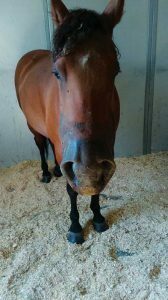 This horse has facial swelling following a rattlesnake bite. Bee stings rarely result in severe disease or death in adult horses, and clinical signs are typically the result of an immunoglobulin E- (IgE-) mediated anaphylaxis. While a small number of stings is sufficient for an anaphylactic reaction, mass stinging events can result in severe disease or death from the toxic effects of the venom itself. The median lethal dose (LD50) of the venom has been calculated to be approximately 10 stings/kg body weight, or 5000 stings for a 500-kg horse. However, bee stings in the muzzle/around the nostrils lead to severe swelling. Insertion of a nasotracheal tube, shortened stomach tube, or syringe case into the nares may prevent airway obstruction. Icing of the nose, an elevated head position, and the administration of antihistamines (diphenhydramine, 0.5 to 1 mg/kg IM or slowly IV) should also be considered. Administration of dexamethasone (0.05 to 0.15 mg/kg IV) and epinephrine (5 to 10 ml of 1:1000 solution IV for a 450-kg horse), as well as a tracheostomy, may be necessary in severe cases. 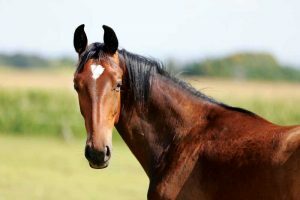 Most snake bites occur during the summer months and the vast majority of horses are bitten in the face. The ensuing head swelling leads to respiratory distress in more than 50 per cent of cases, requiring placement of a temporary tracheostomy tube to secure the airway. Nonsteroidal anti-inflammatory drugs (NSAIDs) and broad-spectrum antimicrobials should be administered to prevent and reduce swelling, pain, and the risk of infection at the site of the bite. Although there is limited research data on the benefits of antiserum in horses, administration of equine-derived antivenin within 24 hours of a rattlesnake bite is recommended. Anecdotally, it reduces swelling at the site of the bite substantially and minimizes the risks of long-term cardiac damage and dysfunction. Laryngeal and pharyngeal obstruction: Similar to nasal obstructions, edema is often a significant component of laryngeal and pharyngeal conditions that cause acute airway obstruction. The swelling results in increased respiratory effort and airway turbulences, which, in turn, encourages the further development of edema. This vicious cycle can facilitate the development of a life-threatening obstruction. Even though tracheostomy is the treatment of choice in severe cases, nasotracheal intubation should be considered in instances where instruments for a tracheostomy are unavailable. If the patient has collapsed, nasotracheal intubation can be the fastest way to secure the airway, as long as the cause of the obstruction does not prevent passing of the tube. Since pharyngeal and laryngeal, as well as pulmonary edema, are common findings in horses with severe UA obstructions, administration of furosemide is recommended. Anaphylactic reactions can cause acute laryngeal edema. In these cases, it is important to remember that pulmonary edema may also develop or is already present. Pulmonary edema can develop as a direct complication of the anaphylactic reaction or secondary to severe upper airway obstruction. The latter is thought to be the result of large negative intrathoracic pressures generated by forced inspiration against an obstructed upper airway. (1 mg/kg slowly IV) and dexamethasone (0.05 to 0.1 mg/kg IV) is also recommended. Sedation should be used judiciously, as α2-agonists increase airway resistance and acepromazine may worsen the possible hypotension in a horse with a systemic anaphylactic reaction. While a nasotracheal tube can temporarily secure the airway, mechanical irritation may further increase the edema, making tracheostomy the preferred method to secure the airway. Sudden onset of severe respiratory distress in the resting horse is an uncommon presentation, but one that can rapidly develop into a life-threatening situation. Even though arytenoid chondropathies typically develop over an extended period, affected horses can present with acute UA obstruction. Once the condition has been diagnosed endoscopically, treatment with throat spray, systemic antibiotics, and NSAIDs should be initiated. In severe cases, an emergency tracheostomy is required. The temporary tracheostomy should be performed caudal enough to allow subsequent creation of a permanent tracheostomy, which may become necessary to permanently secure the airway in bilaterally affected horses. Partial arytenoidectomy is the surgical treatment of choice in unilateral cases. Obstruction usually occurs in horses suffering from septic lymphadenopathy of the retropharyngeal lymph nodes as part of a Streptococcus equi (subspecies equi) (strangles) infection. In cases where a mature abscess is present, draining may sufficiently open the airway; however, it is not unusual that a tracheostomy is needed to improve airflow until the horse has recovered from the disease. Tracheal obstructions: Tracheal stenosis can develop following trauma or be the result of a mass compressing the trachea. Chondromalacia of the tracheal rings is the cause of tracheal collapse, a condition that most commonly affects ponies and American miniature horses. Depending on the tracheal obstruction’s location, diversion of airflow from the site of compression/collapse may not be accomplished with a routine tracheostomy. In most cases of tracheal obstruction, endoscopy and/or radiographs are recommended to identify the exact location and extent of the lesion. The cervical trachea can be severely damaged by a kick to the ventral neck or by collision with a solid object or a rope. If the trauma results in serial cartilage ring fractures, the tracheal wall may collapse during inspiration and cause acute, severe UA obstruction. Even in less severe cases, formation of granulation or scar tissue can lead to airway stenosis in the weeks following the injury. A tracheostomy caudal to the injury site can redirect airflow temporarily, but surgical correction of the actual injury may eventually be necessary. a tracheostomy caudal to the stenosis is recommended. Idiopathic, primary collapse of the trachea has been reported in American miniature horses and Shetland ponies, and is typically characterized by dorsoventral flattening of the cartilage rings. It usually occurs in middle-aged animals, but has been documented in foals as young as two months. In most cases, the intrathoracic and extrathoracic tracheas are compromised, leading to respiratory distress accompanied by honking noises during inspiration and increased abdominal expiratory effort. 2) Mair, T. S. and Lane, J. G. (1996). The differential diagnosis of sudden onset respiratory distress. Equine Veterinary Education, 8(3), 131–136. 3) Prange T, Trachea. In: Equine Surgery, 5th edition, Elsevier, 2018, 797-804. Timo Prange, Dr. med. vet., MS, DACVS, is a clinical associate professor of equine surgery at the College of Veterinary Medicine, North Carolina State University in Raleigh, N.C. He received his veterinary degree from the Justus-Liebig-University in Giessen, Germany in 2002 and worked in private practice in Germany before coming to the United States in 2006. Following his internship at the Marion duPont Equine Medical Center in Leesburg, Va., Dr. Prange completed his residency in equine surgery and master’s degree in large-animal clinical sciences at Michigan State University. 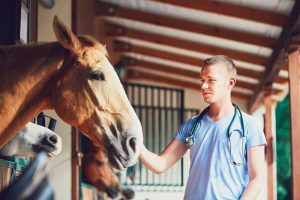 Since 2010, he has been at North Carolina State University where he spends most of his time as a clinician on the equine general surgery service, in addition to teaching students, interns, and residents, and conducting clinical research. Outside of work, he enjoys spending time with his wife and three young children. Prange can be reached via e-mail at tprange@ncsu.edu.